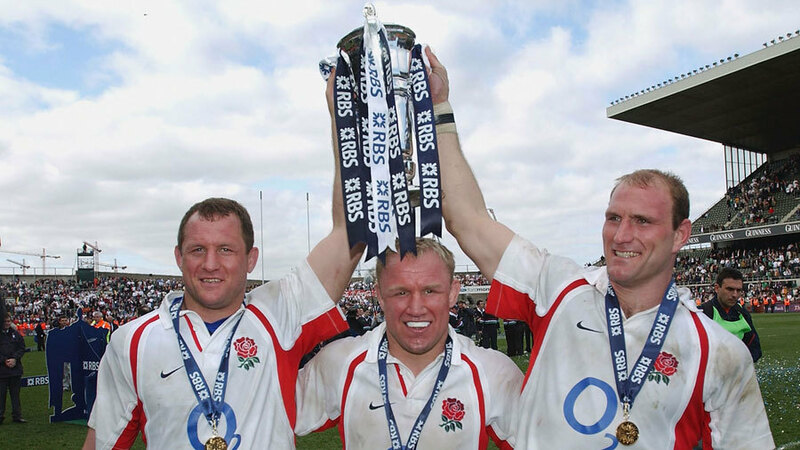 England won the Grand Slam decider with Ireland in Dublin. After a fairly even first half, England ran out convincing 42-6 winners with Will Greenwood scoring two of the tries. 'That was the No.1 team in the world playing on top of their game," Irish coach Eddie O'Sullivan reflected, adding presciently. "They must be favourites for the World Cup." The day started in controversy when England lined up on their side of the pitch and captain Martin Johnson was involved in an altercation with an official after twice refusing to move his team. "We were not going to move," England prop Graham Rowntree explained. "Martin said we were not going to be messed about so we stood our ground." Michael Kiernan's last-minute dropped goal against England in Dublin brought Ireland their sixth Triple Crown overall and their second in four years. Their 13-10 victory at Lansdowne Road also saw them claim the Five Nations Championship title for the third time in four years having captured the crown in 1982 and shared it with France the following year. Bournemouth women's rugby centre Lellani Dowding packed in playing to head to Hawaii for the Miss Universe competition as the reigning Miss Great Britain. "I loved it," she said. "I put lots of tackles in and was a real tomboy and got quite a few bruises. I'd like to play again but I don't think it would be a good idea to travel to Hawaii with a broken nose." She subsequently became a Page 3 model. Highlanders lock James Ryan shocked the Super 14 franchise by announcing that he was to take an "indefinite break" from rugby with immediate effect. Labelled as "potentially one of the great All Black locks" by former national coach Laurie Mains, cited a long-term knee injury, sustained in April 2007, which had required three operations in a year, as the reason for his decision. He never returned. New Zealand's Prime Minister warned the NZRFU that the scheduled tour of South Africa could not go ahead. "The government are totally opposed to sporting contact with South Africans outside NZ," he said. The board stalled as a result and eventually two lawyers successfully sued the NZRFU, claiming such a tour would breach the its constitution. The High Court subsequently stopped the tour. A record four-year sponsorship of £7 million was announced between brewers Courage and the RFU. The brewing company beat off four other rival bids to land the deal which was at the time the second-biggest UK sponsorship behind the Premier League. A rare fullback try, scored by Scotland's Robin Chisholm coming up into the threequarter line, completed a 9-3 win for the Barbarians in their holiday match against Penarth. Tries by Brian Stoneman and Sandy Hinshelwood helped Middlesex to a 9-6 win and the County Championship title against Warwickshire at Twickenham. That proved enough for former England prop Phil Judd who immediately retired, admitting it was "a disappointing way to finish". England Chris Wardlow, selected in the Lions party for Australia and New Zealand, suffered a fractured jaw playing for the Northern Counties against Coventry ruling him out the tour. He never got another chance, nor did he add to his six England caps, and his career was ended when he broke his leg playing in South Africa four years later. Bath beat arch-rivals Bristol 43-5 (seven tries to one) at Bristol on their way to the Courage league title. Llanelli Grammar School included future Wales and Lions fullback Terry Price in the seven that beat Rydal, another Welsh school, in the final of the prestigious Rosslyn Park schools tournament.